Acupuncture in veterinary medicine has been used to promote balance in the body's total energy system and ability to heal. In all animals there are precise locations on or near the surface of the body known as acupuncture points; these points, when stimulated, may produce changes in the body's internal organs and functions. Traditionally, inserting a fine stainless steel, gold, or sterling silver needle into the point does the influencing of these points. Other methods of stimulation include the application of heat, electricity, laser light, or injection. Veterinary acupuncture utilizes both the ancient theories of Traditional Chinese Medicine (TCM) and the western observations of physiological response and correlation of effect, in the selection of acupuncture points to treat. Whenever Qi becomes disrupted imbalance occurs and disease may result. The flow of Qi may be influenced by the stimulation of acupuncture points. Qi may be nourished by proper food, herbs, exercise, and body manipulation. The stimulation of acupuncture points by needles or other means is an attempt to re-establish the proper balance or flow of Qi throughout the body. The use of herbs, homeopathy, nutritional support, and exercise are implemented in an attempt to assist the body in obtaining the appropriate Qi it must acquire from its environment. Acupuncture helps to reset the energy system "circuit board" by balancing the flow of Qi within the body. Excesses or deficiencies of Qi from inappropriate diet, exercise, sleep etc., may be addressed by herbal, dietary, and physical therapies. Stimulate immunity by increasing white blood cell count and antibody production. Acupuncture's influence on the body's nervous system is such that it may inhibit pain and increase cardiac output, as well as stimulate bone healing, and suppression of the cough reflex. Several theories have been used to explain the effects produced by the treatment of acupuncture, but none of these theories, standing alone, is able to explain the effects observed. Implants – the surgical insertion of gold or silver beads at acupuncture points for a permanent stimulation. Acupuncture can be the only method of choice, or it may be combined with other treatment modalities such as chiropractic, homeopathy, herbal or nutritional support. Acupuncture may also be combined with more conventional western treatment modalities to enhance the body's response to the treatment. Pregnant animals not yet ready for labor are not good candidates for acupuncture. Animals with high fever should not be treated with acupuncture only. Acupuncture should be combined with appropriate antibiotic and/or herbal treatment and can then accelerate healing and help decrease discomfort. While acupuncture works harmoniously with most other forms of treatment, certain drugs can significantly alter the effects of acupuncture. Ideally, the patient should not receive acupuncture treatments while on tranquillizers, narcotics, steroids (cortisones), or anticonvulsants. There are times when acupuncture is necessary while taking these drugs, but the effect(s) may be inhibited by the drugs' presence in the system. One should always make sure that the acupuncturist is aware of what drugs the animal is taking when brought in for treatment. There is a limit to how much acupuncture will help an animal. It may be that the disease or trauma has progressed beyond the point where acupuncture can arrest or reverse the damage, and all it can do is provide supportive care and symptomatic relief. The animal should be allowed to receive plenty of rest after a treatment so that it's body may impart the maximum benefit of the treatment. Animals may exhibit reactions to acupuncture treatments for 24-48 hours afterward, they may exhibit no immediate change or may become very sleepy or hyperactive probably due to sudden changes in the energy flows within their body. Either extreme, or even no reaction at all, is not to be considered as cause for alarm. One must be sure to continue with the prescribed medications. To help with future treatments, the owner should make note of any change in the animal's attitude, gait, alertness, appetite, bowel, and urinary movements. All of these signs direct the acupuncturist in the correct direction for future treatments. There are occasions following an acupuncture treatment when the animal will exhibit a "rebound effect" during which time it's symptoms seem to worsen for up to 72 hours, then suddenly the animal begins to improve. The rebound effect may be seen as a good sign, usually because the animal becomes markedly better after the 72-hour window preceding the acupuncture treatment. Please call our office and alert us as to the animal's symptoms should this event occur. This effect may be explained by the temporary removal of the compensatory energy routing the body has accomplished to maintain a homeostasis of energy flow. The acupuncture redirects all energy flows back into a more harmonious pattern, which will speed healing, but which may put the body's system "out of whack" until the energy flows through the new directions strongly. There are several other rare complications associated with acupuncture treatments: The breaking of a needle while in the skin or subcutaneous tissue, which may be remedied by nothing more complicated than minor surgery Hematoma formation, which is the pooling of blood from a punctured blood vessel Striking a nerve during the placement of an acupuncture needle; and very rarely, only under deep needle insertion, an organ may be punctured. Before pursuing treatment with acupuncture, a physical examination- complete with a full medical history, diagnostic laboratory tests, and radiographs (x-rays)- is usually performed. There are some conditions for which a single acupuncture treatment is all that is required. In most instances, however, there are multiple treatments spread over weeks or even months to reverse some chronic conditions. For more involved treatments at Loving Touch Animal Center, we ask that the client be willing to commit to a minimum of three acupuncture treatments in order to give a chance for the improvement to be seen. The more traditional Chinese approach requires six treatments before there may be any improvement. Typically, the acupuncture treatments are spread weekly, but occassionally they may be required two times weekly or overy two weeks, depending upon the animals' condition. As the animal responds to the treatments, the length of time that the treatment remains effective is noted, and the treatment intervals may become longer, or even, no more treatments may be necessary. Chronic conditions may require treatment monthly or several times per year, once the initial response level has peaked, and maximum effect is to be maintained. 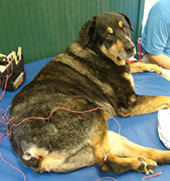 During the acupuncture treatment itself, most animals exhibit little or no pain or discomfort. Most of our patients will lie down during a treatment with their owners holding them, and take a nap. A few animals, with a very high anxiety level or extreme fear reaction to being confined in a veterinary office, require more coaxing to be still. It is only in extraordinary circumstances that we chemically restrain the animal. The treatment itself may last ten seconds to thirty minutes, the average treatment being ten minutes. In order to practice veterinary acupuncture, a considerable amount of knowledge is required. In the United States, the International Veterinary Acupuncture Society (IVAS) is the visible leader and currently sets the standard for recognized training and certifications of American veterinary acupuncturists. 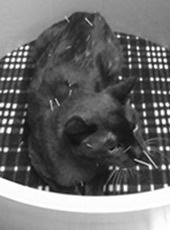 A 19-year-old cat suffering from sinus congestion relaxes during acuncture and magnetic field therapy. Copyright © 2019 Loving Touch Animal Center. All rights reserved.